Camy Poulin from Nipawin Sask, stitched these Dragonflies. She started it in a workshop with Janice Routley. 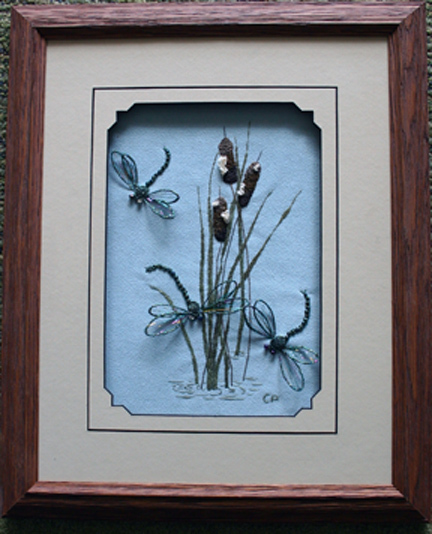 The piece is stitched on ultra suede and does really look like the Dragonflies are dancing. Way to go Camy, a great job. Camy originally joined Pine Needle Arts Guild just to get sometime to do her cross-stitch! She did eventually finish the cross-stitch , but along the way she has tried many other techniques. She has become accomplished at Blackwork, Hardanger, Crazy Quilting, Canvas work, Stumpwork and learned to quilt. More importantly, Camy has realized she can try any number of techniques and her guild members can help her, or now, she can help them. Pine Needle Arts Guild is the guild I belonged to until we moved to Ontario. I miss you ladies, we learned a lot together.